A Newly Refurbished CSSD Unit at Makassed Hospital. Thanks to the generous donation of Mr. Nabil Haddad, Makassed General Hospital celebrated the opening of its newly refurbished Central Sterile Supply Department (CSSD) on Friday, January 20, 2017. 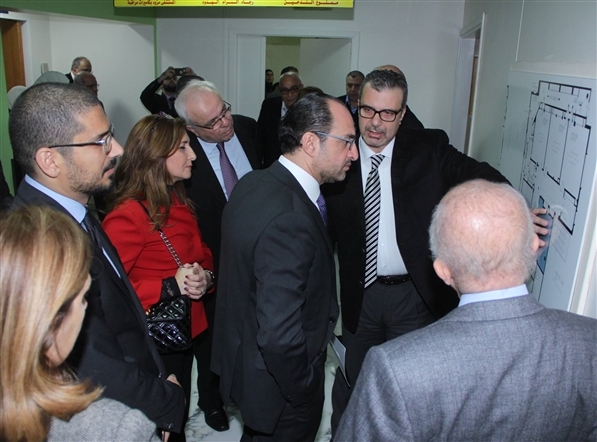 The launching of the new unit was attended by President Amine Daouk, members of the Makassed Board of Trustees, Makassed Hospital leadership, and Mr. Nabil Haddad and his sister Mrs. Rima Haddad. Mr. Haddad emphasized the important role that Makassed plays in supporting its community and pointed out that this project is the beginning of a long journey with Makassed Association. The donation of Mr. Nabil Haddad has helped the hospital in purchasing the equipment needed for guaranteeing a high quality and level of sterilization for the central medical supplies at Makassed hospital. The Central Sterile Supply Department at Makassed Hospital provides complex services including the preparation of sterile medical supplies for the surgery rooms and all other stations and centers of the Hospital. The scope of the tasks and responsibilities of this department places this department as a unit which deals with the prevention of nosocomial infections and represents one of the core aspects of comprehensive health care. Mr. Haddad donation has helped us benefit the community which we serve.